When salvaging a garden like the one at Harrison Street Park, don't be deterred by the wall of mugwort and Canada thistle--the default weeds that swoop in when a garden loses its gardener. Rather, be encouraged by woodland asters that have improbably survived in this thickening sea of weeds. Commence pulling, not with a jerk but with slow, steady pressure so that the mugworts' formidable root systems come up with the plant. Pull the garlic mustard, too, before its pods mature and shatter. Some bag them up and throw them in the trash, but I don't want to create more trash to haul off to the landfill, and put the garlic mustard instead in one pile that can be monitored for any sprouting the next year. This autumn clematis, though it has a pretty flower, is future trouble, known to form wide ranging underground root systems that sprout all over a garden. Dig it out while the digging is easy. Star of Bethlehem looks innocent enough as well, but can also be invasive. Honeysuckle shrubs, another component of the default landscape asserting itself, block the view of the garden and an attractive stone sitting area that was part of the installation five or six years ago. A couple hours of pulling made the original plantings visible again, with the weeds forming a mulch along the edge, left to dry in the sun. If there was a leaf corral in the park to demonstrate sustainable landscaping, the weeds could have been tossed on top of last fall's pile of leaves, to slowly decompose and return to the soil. and this more authentic-looking foamflower, which like the woodland phlox is almost never seen in the wild. A garden in an urban park, then, can be a place for people to encounter components of the natural heritage that for one reason or another have not survived in Princeton's nature preserves. A vision for attractive, low-maintenance curbside landscaping appears to be spreading across the municipal swimming pool's parking lot. The combination of mulch and perennials means little upkeep needed beyond an occasional watering. The default lawnscaping still found elsewhere in the parking lot requires mowing, watering, and broadleaf herbicide, which I was told by a former rec dept director was necessary to keep white clover from growing. The clover flowers attract bees, which don't go well with barefoot swimmers. The new garden looks to be the offspring of other gardens nearby. There's the Dogwood Garden Club's garden, here on the right, and Vikki's plantings in front of the parks and rec offices in the distance. Vikki, a rec dept. employee, had already expanded her gardens beyond the walls and down towards the police department's parking lot. It's in the nature of well-tended gardens to expand, since the perennials benefit from occasional division, insuring lots of new plants that need new space to grow in. At the other end of the municipal parking lot, another garden prospers, at Community Park Elementary. There's the edible portion in the front, and a more prairie-like garden in the back courtyard. Here, too, is a similar story of one garden inspiring another, until gardens now grow at all Princeton public schools. A more detailed story of this greening of schoolyards--with Karla Cook, Dorothy Mullen, science teachers John Emmons and Martha Friend, and many other parents, students and teachers playing a role--can be found at the Princeton School Gardens website. It may even explain what these cups signify--perhaps something to do with celebrating ten years of gardening at CP school. Add to this the community gardens around the corner on John Street, overseen by the rec department, and one has a central example of a public gardening renaissance in Princeton. There's been great progress in the battle against bamboo being waged by my next door neighbor and myself. Last year, I alerted the long-distance landlord to the fact that the bamboo had started actually prying the siding off the other side of his house by growing up between the siding and the foundation. He hired a crew to take action. They cut down all the bamboo, planted grass, declared victory, and haven't been seen since. That was an important first step, but it won't do much good unless there's followup. As this picture shows, the battle is far from won. In the lower right, you can see the bamboo has sprouted once again along the foundation. And over on the left, hundreds of new shoots have shot some ten feet into the air. Another angle shows that the bamboo roots, still intact, had plenty of stored energy to send up long shoots that are just about to deploy solar panels in the form of leaves. Now, while the stems are soft and the roots have invested energy without yet gaining any solar return, is the time to cut these stems down. Otherwise, the bamboo will fortify its root system and be well along the way to regaining its former mischievous glory. Unfortunately, the neighbor on that side of the rental is not joining in the fight. The prognosis is much better on my side of the rental. For my part, yesterday I dug up every last bamboo shoot I could find, pulling out as much of the root as I could. You can see in the lower right the thick rhizomes that form a dense clone, requiring that the whole clone of bamboo be repeatedly cut down in order to starve the roots. Most likely, a similar resurgence is happening right now at the Princeton Battlefield, where volunteers cut down all the old bamboo stalks earlier this spring. How much easier their battle will be next spring if they round up a battalion now, when the time is most ripe for followup, and wield loppers to foil the bamboo's quiet resurgence. Two other neighbors appear to have teamed up with a chemical assist, which I've never tried. On the premise that holiday weekends can sometimes have unexpected gaps, I'll be leading a nature and culture walk at Herrontown Woods--Sunday, May 24, at 1:30pm. Others with the new nonprofit Friends of Herrontown Woods may join in, to talk of recent habitat restoration efforts and the mysteries of magnetism found in some of the boulders. Culture comes into play with the Veblen and farming legacies. Meet at the parking lot (it's down the short road across from Smoyer Park entrance on Snowden Lane). Read about all the doings at Herrontown Woods on facebook and at VeblenHouse.org. For some environmental theater, come by this month's Cafe Improv at the Arts Council of Princeton this Saturday, May 23, around 8:40-9pm, for some Climate Change Cabaret. We'll perform three comic sketches: Complaint Training, Carbon Dating, and Breaking Up With Your Car. The full lineup for the 7-10pm show is at http://www.cafeimprov.com/. Some videos of sketches we premiered at the Princeton Public Library this past March can be found at SustainableJazz.com. The Rotary Club of Princeton includes the Veblen House at Herrontown Woods among its service projects. They're having their annual Pancake Festival fundraiser at Palmer Square this Saturday, 8am to noon. Money raised goes to community projects and scholarships. All you can eat--pancakes, fruit and bacon--for $10. Pre-K free. Build a garden, like Dorothy Mullen did over many years at Riverside School, and they will come. Dorothy has since moved on to other projects, but only after the garden had become woven into the school's curriculum. It's role in educating kids is sustained in part by the spring garden fair, which this year raised $5000. Dorothy had a table, where she was giving away seeds and making small batch sauerkraut with massaged cabbage and salt. She has an amazing website at thesuppersprograms.org that's full of recipes. The cider press got a workout, turning apples bought at Terhune Orchards into cider. I asked a few questions, and got a story about how apples originate from an area of Asia where forests of wild apple trees still grow. He agreed that Stayman apples enhance the taste of cider, and said that most cider is made from red delicious apples, which originally had a lot of taste but lost it over years of breeding for color. I had a little display about the Friends of Herrontown Woods and the Veblen House, along with some native wildflowers to sell. A couple tables down, I was surprised to see edible insects being sold. I didn't think the future would arrive so soon. Competing with the grasshoppers and crickets were silkworm larvae and chocolate covered scorpions. I decided to be conservative and went with the grasshopper. Tastier than the batch I bought at a tourist site in Mexico. Even the bees came to the fair, to check out the garden, to be checked out themselves, or to just bee. It was a very pleasant way to raise money for a good cause. As chief organizer of the event, Beth Behrend, described, "These funds enable us to maintain our beautiful school gardens and offer over 120 hours of garden lessons per year to our 250+ Riverside children. These sessions are life-changing for our children and their families. Kids enjoy hands-on lessons about healthy food, where it comes from, how to plant, cultivate and harvest, and what it tastes like - and share this knowledge (and even requests for vegetables) at home. Princeton elementary schools now use garden “classrooms" to teach science, social studies, health, math and other subjects." During an otherwise very positive weeding session in Harrison Street Park, I spotted a small Viburnum shrub that appeared to be a ghost of its former self. Every last leaf had been skeletonized. As I took a closer look, I was afraid of what I might find. Native to Europe, the Viburnum Leaf Beetle was transported to our continent and has been spreading across the eastern U.S., decimating native and exotic Viburnums as it goes. This closeup corresponds with what can be found on the web. As far as I know, and I'll check with the extension service, this is the first documented occurrence in Mercer County. (Update, May 20: I called today, and they are in the process of confirming a sighting in Pennington.) The map on the NJ Invasive Species Strike Team website shows documented occurrences in other areas of NJ. My first encounter with it was some five years ago in a park in Pittsburgh, where a grove of arrowwood Viburnums (V. dentatum) had been transformed by the insect from robust green to brown ooze. The only good news is that only two Viburnum shrubs in Harrison Street Park had been visually affected. This photo shows the early stages of attack. I tried to kill every last larva I could find. Chances are, this is not the only infestation in Princeton. Homeowners should check any Viburnums in their yards for signs of damage. Some suggestions for control can be found at this link. Not all Viburnums are equally vulnerable, as this Cornell University list shows. Among our three most common native species, arrowwood Viburnum (V. dentatum) is the most vulnerable, followed by mapleleaf Viburnum (V. acerifolium), with blackhaw Viburnum (V. prunifolium) being the most resistant. Arrowwood Viburnum is generally found in low-lying woodlands. Mapleleaf Viburnum is a small shrub, rarely encountered except along the ridge. The blackhaw Viburnum is the largest and most common native Viburnum in Princeton. A Penn State website suggests that the insect prefers Viburnum species with less pubescence on the leaves. Most people have heard of Emerald Ash Borer by now, which was spotted for the first time in Mercer County last year. One ecological consequence of losing most of our ash trees over the next ten years is that more sunlight will then reach the understory, which is dominated by non-native shrubs like honeysuckle, privet, asian Photinia and winged Euonymus. Viburnums are a main component of the native understory. If they are severely weakened by Viburnum leaf beetle, then they'll be even less able to compete with exotics for that additional sunlight. A recent presentation by entomologist Douglas Tallamy in Princeton offered evidence that not only is the foliage of native plant species necessary for the survival of countless species of insects, but their berries are much more nutritious for birds. How we are to keep foodchains intact in our forests is something of a question. In addition to being vigilant and acting quickly if an infestation is found, one thing to do is take a moment to appreciate the Viburnums and ashes we have--the play of light on their leaves, the colors they turn in fall. In a largely unregulated world where powerful forces of change continue to be unleashed, there's a heightened poignancy in what we all too often take for granted. To salvage something of value, we don't need to seek out ships at the bottom of the ocean. Just go to the neighborhood park, where good intentions have left a legacy of blue flowers that, without intervention, would be lost in a sea of weeds. The wood phlox (Phlox divaricata), a native pollinated by sphinx moths, looks in this photo to be doing great. No threat to be seen. There's a healthy spread of violets as well. There's even a native chestnut seedling planted in a deer-proof container, meaning the site is taking part in an effort to bring back one of the great north American tree species. But step back and you start to see that these thoughtful plantings are beginning to be buffeted by waves of invasives. That white flower is garlic mustard. It's edible and makes a decent pesto if the leaves are picked when young, but in the meantime it is overgrowing the phlox and waging underground chemical warfare against other species. Here we're looking down on the dense seedlings of mostly garlic mustard that will be next year's dominating wave. Mugwort, even more of a threat, is advancing from the north. Burdock (large leaves at top of photo) and curly dock (rosette of smaller leaves close to wall) also shade out the phlox. One could say live and let live, except the longterm consequence, given the Phlox's inability to compete with the invaders, is live and let die. The good news is that the phlox is showing enough vitality that, with just a little timely intervention, it could continue to flourish in this hidden public garden right next to busy Harrison Street. Since I've never seen wood phlox growing wild in Princeton, this planted garden can show what may have grown in Princeton before development, invasive species, and the deer's intense browsing pressure transformed the landscape. We can look most anywhere and see a sea of weeds. Here's a chance to sustain a distinctive sea of blue. In the event-rich world of Princeton, I'll mention two coming up this weekend. 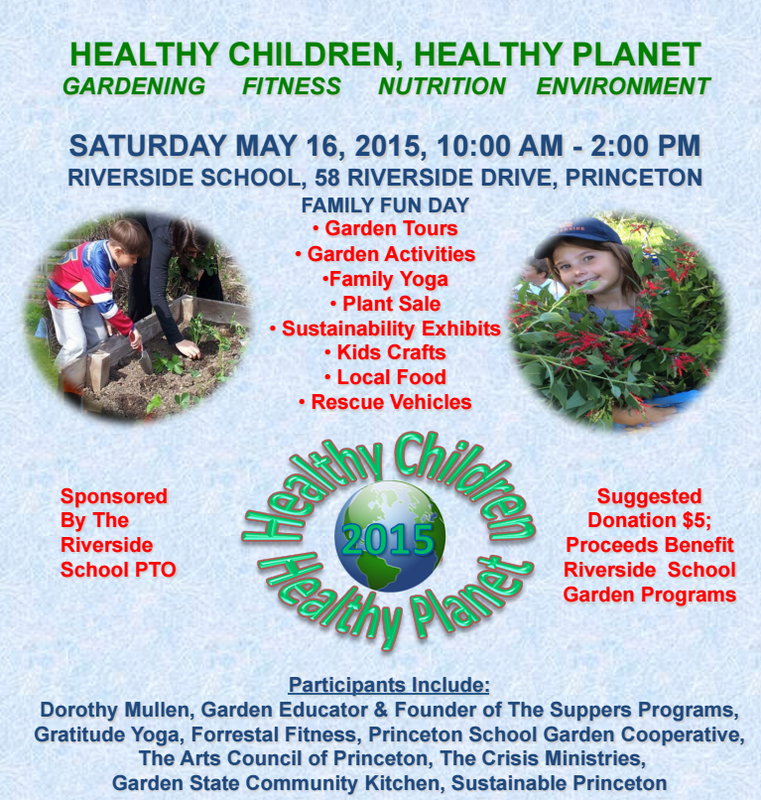 Riverside School Garden Fair: This is a great event for adults and kids. See flyer below. I'll have a table with some native plants for sale and info about our new nonprofit, Friends of Herrontown Woods (VeblenHouse.org, or facebook page here). Birdwalk at Princeton Institute Woods: Washington Crossing Audubon leads field trips all spring. This Saturday and Sunday, May 16 and 17 at 8am, you can join the walk at the entrance to Rogers Refuge. Scroll down at this link, and also see below, for more info. The Audubon-sponsored walk this weekend will start at Rogers Refuge, which is American Water-owned land between Institute Woods and the stream that feeds Carnegie Lake, better known as Stony Brook. Here is the view from one of two observation towers built by the Friends of Rogers Refuge. The wetland, maintained by the Friends, municipal staff and the American Water company, complements the deep forest of Institute Woods and has long been a birding mecca. Years back, I wrote an ecological assessment and stewardship plan for Rogers Refuge with a grant from Washington Crossing Audubon. Lots of native plant sales coming up this weekend and next. Most of them continue to offer plants for sale throughout the summer. Click here to view the full plant catalog. Members' Preview Lecture: Friday, May 8, 2015 Noon - 1 p.m. Member's Preview Sale: Friday, May 8, 1:00 - 6:00 p.m.
Sale Opens to the Public: Saturday, May 9, 10:00 a.m. - 4:00 p.m. Please join us for a unique opportunity to tour a native plant nursery and purchase plants from Pinelands Nursery. Pinelands is a wholesale-only nursery and is usually not open to the general public. Join Don and Tom Knezick for a tour of the expanded operations. After the tour, native plants will be available for purchase. The tour is free, but registration is required. If you're looking to garden this year but don't have space, why not rub shoulders with some of the area's history and adopt one of the raised beds at Rockingham. I was told at Communiversity that the Stonybrook Garden Club is no longer tending to the gardens, and Rockingham has decided to offer the individual beds to willing volunteers in the community. They may still have a bed or two available. These are photos from a previous post about the place. George Washington stayed there while the U.S. government was briefly based at Nassau Hall in Princeton. The story goes that he rode his horse into town on what is now Mt. Lucas Road. There was a small quarry on the property back then, and the house has been moved three times since, because of all the highly marketable trap rock they kept finding underneath it. Staff say that the house is now safely in a spot where it will not be disturbed again. They've added an orchard and just finished installing a barn, which they plan to use for hosting events. The house is just outside Kingston, perched above the Millstone Valley. Might be a good destination for a bike ride down the DR Canal towpath. What I remember most vividly from my visit there, for some reason, was the thorns on the hawthorn trees, which in Washington's day were used for pins in clothing. People wore nature back then. Contact for the Friends Group for Rockingham is 683-7132, and rockingham.net. On the fringe of a town park, during an hour on the fringe of our day, Clifford and I prepared a public garden for the summer to come. It competes, like all to-do's on the fringes of our lives, with countless other priorties, yet it's a garden we planted together, and we're the ones who know how to take care of it. And besides, spring cleaning gives us a chance to catch up on each other's lives. but then I noticed some mugwort starting to get established near the back fenceline, and decided to put them to use. Overlapping pieces of cardboard were placed over the mugwort, topped by the dead stalks of spent sunflowers. Less work for the parks crew, less mugwort, which has overgrown some of the other, less robust plantings in the park. Win-wins are important when time is scarce. The sticks may look a little untidy right now, but they'll quickly disappear beneath new growth, and will help cool the soil and retain moisture during the summer months. Though the garden looks drab and static, a gardener can see the forces at work. In this springtime still-life, life is anything but still. Like schoolchildren on a slow-motion flowerbed playground, each plant species has its own personality. Some "play well with others", content to stay where they're planted. Some are bullies, grabbing space and sunlight from the less aggressive sorts. A good "playground supervisor" sees the conflicts coming, and intervenes before things get out of hand. Native sunflowers, with their aggressive underground rhizomes and height advantage, have been steadily advancing to claim the whole space. There are still some non-spreading species hanging in there. Hibiscus moscheutos, tall meadowrue and cutleaf coneflower are tall enough to compete, leaping for a piece of the sun in this botanical game of basketball, but even their years are numbered if we don't return to weed out some of the aggressors. Years back when we planted the garden, we did a lot of things right, but made a common mistake, thinking it was okay to plant the perennial sunflowers to fill some of the copious space, because surely we'd be vigilant enough to limit their spread. Now we'd need to weed out hundreds of new sunflower shoots each year if we wanted to preserve the diversity from which comes a variety of blooms throughout summer and fall. The result is pleasing enough, though, with spectacular yellow blooms in late summer, and essentially no weeds. Any garden that's weed-free and attractive while requiring only two man hours of work per year can be considered a success. Elsewhere in the park, in flower beds planted by contractors as part of a grand design, the weeds are getting the upper hand. What looks like undifferentiated green in this photo is really a mixed bag. There's still some diversity, but the botanical bullies are poised to take over. That big clump with pretty yellow flowers is an ominous sign. Called lesser celandine, it's a nonnative that will spread aggressively if left to grow. Now, when there's only one plant in the entire park, is the time to dig it out, put it in a plastic bag and send it to the landfill. Garlic mustard is another aggressive spreader best pulled now, before it starts growing flowers. Elsewhere in the flowerbed, in this sea of nonnative Canada thistle and mugwort, is one of the intended native plants--wood phlox, barely noticeable there on the right. It will soon offer a beautiful blue flower, but the best time to take action is before it starts flowering. Someone with a good eye for plants needs to swoop in and save it from the quiet sea of aggressors rising all around it. Most native plantings are low-maintenance. Like any sort of management, if you get everything running smoothly, the manager's workload will be light. With some strategic timing and finesse, and auspicious siting of the gardens to take advantage of sun and runoff, the mutiny of Canada thistle in this photo would be caught early and kept from gaining momentum. Who might do this work is a good question. Princeton employs only one staff person whose job it is to know one plant from another--one more staff than most towns hire. That's the arborist, whose primary focus is on trees. Another employee, in the recreaction dept, tends to the beautiful plantings around the rec offices and swimming pool, but that's above and beyond her official duties. In most parks, grass gets mowed, trees get some attention, but the rest of the plant kingdom is on its own, unless some volunteers come along with time and knowledge. To sustain more interesting and attractive plantings, there would need to be someone who knows the plants, knows the various times during the year when strategic intervention will be most effective, and can mobilize some volunteers to do the work. If someone is, or at least feels, responsible, then parks can be a playground for plants as well as people, a place where people can get to know something of our natural heritage. A garden is a long-range commitment. If done right, it can be sustained, year after year, along the fringes of a park, with a few hours now and then, found on the fringes of our days.